To all of our members, the Wilmington-Cape Fear Home Builders Association has been extremely fortunate to weather Hurricane Florence with minimal damage. Unfortunately, the place that many of us call home has not been so fortunate. As many of you know, there was widespread damage with down trees, power lines, and flooding issues. We have compiled an ever-growing list of resources to aid those who have been negatively affected by the storm. Please refer to the links below to get started. If you have any immediate needs, questions, or valuable information that you would like to share with the membership, please contact our Executive Officer, Cameron Moore at cameron@wilmhba.org or call him directly at (910) 799-2611. For up-to-date storm-related information, please follow us on Facebook and Twitter. As we receive additional pertinent information from verified sources we will be posting them on a regular basis to provide key updates as we recover from Hurricane Florence. In addition to this information the NCLBGC has developed a free mobile app that will allow the public to do a search for an active licensed contractor in their county. The app is available for Apple or Android devices by typing ”NCLBGC SEARCH” in the search function of the app store. NCDOI Releases key clarification information to Inspections Departments on damage assessment & damage evaluations. This clarification is key as it specifically states the process that must take place to render a property habitable or not. The Federal Emergency Management Agency announced that federal disaster assistance has been made available to the state of North Carolina to supplement state, tribal, and local recovery efforts in the areas affected by Hurricane Florence. The President’s action makes federal funding available to affected individuals in Beaufort, Brunswick, Carteret, Craven, New Hanover, Onslow, Pamlico, and Pender counties. Assistance can include grants for temporary housing and home repairs, low-cost loans to cover uninsured property losses, and other programs to help individuals and business owners recover from the effects of the disaster. Individuals and business owners who sustained losses in the designated area can begin applying for assistance by registering online at www.DisasterAssistance.gov or by calling 1-800-621-3362. Disaster assistance applicants, who have a speech disability or hearing loss and use TTY, should call 1-800-462-7585 directly; for those who use 711 or Video Relay Service (VRS), call 1-800-621-3362. You can apply online for all types of SBA disaster assistance loans. The online application is the fastest method to receive a decision about your loan eligibility. You have the option of submitting a paper application by mail. For either application, you must submit the completed loan application and a signed and dated IRS Form 4506-T giving permission for the IRS to provide SBA your tax return information. You may also apply in person at any Disaster Recovery Center and receive personal, one-on-one help from an SBA representative. For information or to find a location near you, please contact our Customer Service Center. Call 1-800-659-2955 (TTY: 1-800-877-8339) or e-mail disastercustomerservice@sba.gov. Hurricane Florence left a wide path of destruction throughout the entire state and especially in central and eastern North Carolina. In light of this disaster, the Board of Directors of the North Carolina Home Builders Educational & Charitable Foundation, Inc. (NCHBECF) announced the establishment of the “Hurricane Florence Disaster Relief Fund” to aid members of the North Carolina Home Builders Association (NCHBA) in recovering from the devastating effects of Hurricane Florence. Coastal property owners who need to replace docks, piers, bulkheads or similar structures damaged by Hurricane Florence along sounds, rivers and creeks may be authorized to do so more quickly through an emergency general permit offered by the N.C. Division of Coastal Management. The emergency permit expedites the approval process for rebuilding docks, piers, bulkheads and similar water dependent structures that meet state standards. The emergency permit may also be used for dune reconstruction and maintenance dredging of existing channels. The normal $200 permit fee is waived for the emergency permit, and, in many cases, no site visit or adjacent property owner notification is required. Secretary Regan activated the emergency permit today. It can be used in all 20 coastal counties: Beaufort, Bertie, Brunswick, Camden, Carteret, Chowan, Craven, Currituck, Dare, Gates, Hertford, Hyde, New Hanover, Onslow, Pamlico, Pasquotank, Pender, Perquimans, Tyrell, and Washington. The permit does not eliminate the need to obtain any other required state, local, or federal authorization. To see Regan’s signed activities, click here. Today the North Carolina General Assembly met to start the process of how the state would fund the recovery process from Hurricane Florence. One item that was included was to allow the Governor to waive the Homeowners Recovery Fee that is paid as part of a building inspections. Many areas are waiving inspection fees but did not have the authority to waive that part of the fee. SECTION 5.6. (a) Notwithstanding G.S. 87-15.6, the Governor may waive the fee assessed by city and county building inspectors and credited to the Homeowners Recovery Fund for the reimbursement of homeowners suffering reimbursable losses in constructing or altering a single-family residential dwelling unit. SECTION 5.6. (b) The waiver authorized under subsection (a) of this section only applies to residents of counties impacted by Hurricane Florence, as determined by the Governor. A permit applicant is allowed a refund of any fee assessed and collected by city and county building inspectors and waived pursuant to this section. A city or county subject to this section shall post notice of the availability of a refund on its Web site. SECTION 5.6. (c) This section is effective when it becomes law and applies to applications for issuance of a permit subject to the Homeowners Recovery Fund fee that were received on or after September 13, 2018. This section expires December 31, 2018. The Governor is expected to sign the bipartisan legislation so that it will then become law. Brunswick County has enacted its debris contract and residents in unincorporated areas of Brunswick County should sort debris and leave it by the road for pick up. Brunswick County’s Commissioners also authorized the collection of debris on state-maintained roads and private roads which are open to the public. Unincorporated areas are areas not in a city or town. Citizens who live in a city or town should check with officials for their town for debris instructions. Debris should be placed in between the sidewalk and the road; debris placed from the sidewalk toward your property will not be picked up. Citizens who do not have a sidewalk, ditch or utility line in front of their home should place debris at the edge of their property near the curb or edge of the road. Placing debris near or on fire hydrants, water meters, trees, poles or other structures makes removal difficult. Crews will move through the County several times collecting debris; citizens who evacuated from Brunswick County should not rush to come back to put out debris, as there will be multiple collections. Tip fees will remain in place at the landfill, in accordance with FEMA requirements. Debris collection in unincorporated areas of New Hanover County will begin Monday, September 24, beginning with county parks and schools, then moving to unincorporated areas. Crews will make no less than two passes over the county to ensure debris is cleared as timely as possible. The City of Wilmington, as well as Carolina, Kure, and Wrightsville beaches are each coordinating debris collection for their residents, and can be contacted directly for information. Gated communities must provide permission to enter or a gate code to Environmental Management by emailing JSuleyman@nhcgov.com. Private roads will be serviced as long as a large truck can enter and have space to turn around to exit. Those who live on small private roads are asked to consolidate debris piles with neighbors at the front of the road. For information about how to dispose of other debris, click here. 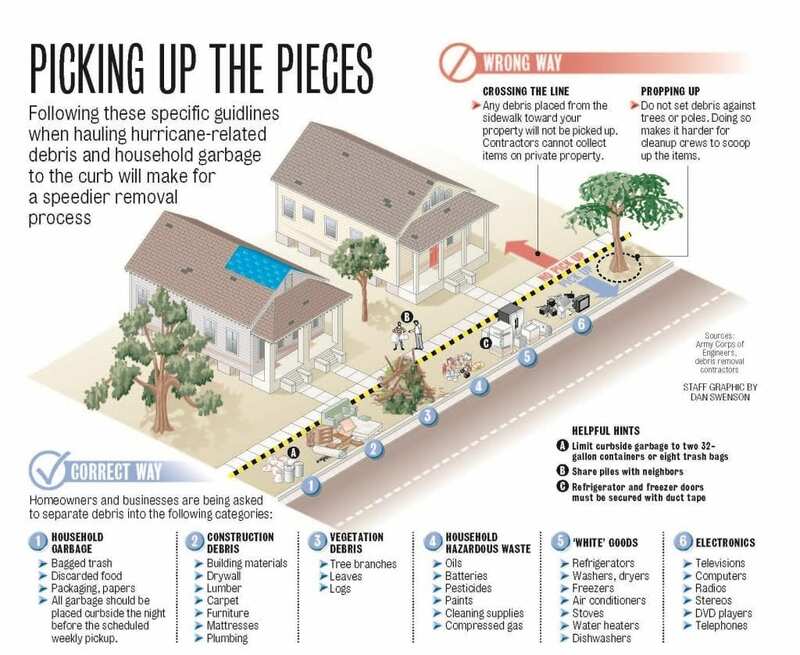 Storm debris should be divided into 6 categories according to FEMA specifications following Hurricane Florence. To see more in depth information about these divisions, click here. Pender County Utilities opened the county’s solid waste collection centers Sept. 20 for HOUSEHOLD GARBAGE ONLY. Proof of residency or driver’s license will be required. Debris from the storm and vegetative matter will not be accepted at the site. The county has hired a debris contractor for collection of those materials. Burgaw Convenience Center, 3088 New Savannah Rd. Further information on other sites will be made available as soon as possible.